(Grand Cayman - Wednesday, 13 September 2017) Following the success of the Cayman Islands Monetary Authority’s (“the Authority”) inaugural 5K & 10K Charity Walk/Run recently held in May, the Authority raised a total of CI$10,969.77. The funds were donated to the literacy and numeracy programmes within various local government primary schools. The event was organised as part of the Authority’s 20th Anniversary celebration which was recognised earlier this year on 1 January. The Authority extends special thanks to: DMS Gives Back, DMS Bank & Trust, Strategic Risk Solutions, Mr. Michael Austin, Insurance Managers Association of Cayman (IMAC), Walkers, A.R.C. Directors Ltd, HighWater Limited, Greenlight Re, CIBC Bank & Trust, Carne Group, and Maples FS. Other supporting groups were: Green2Go, Red Cross, RCIPS, CI Government Wellness Team, Race Caribbean, Cayman Islands Hazard Management, along with many other companies that donated raffle prizes. Mrs. Scotland also confirmed that this will become an annual charity event, supporting various grassroots projects within the local schools. For a list of the race results, visit Cayman Active. 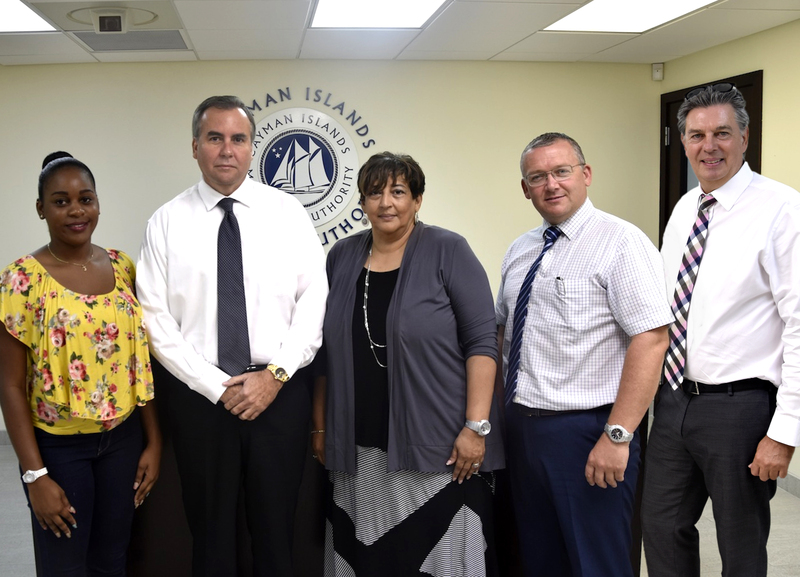 Photo caption: CIMA’s Deputy Managing Director-Operations, Mr. Patrick Bodden (second from left) is pictured with (L-R): Ms.Tiffany Lightbody of East End Primary School, Ms. Marcia Rennie of Edna M. Moyle Primary School, Mr. Paul Samuel of John A. Cumber Primary School and Mr. Wayne Roberts of Cayman Islands Behavior Support Service. Missing from photo: Ms. Marie Martin of George Town Primary and Ms. Carol Nyack of Savannah Primary School.